The third member of the "Old Boys" to die on the Western Front was eighteen year-old Rifleman Bernard Henry Spray who was killed in action on 5th August 1915 after just fifteen days on French soil. Bernard was the only son of Edwin Spray and his wife Mary, of 50, Middle Street, Beeston, and was probably Beeston’s youngest hero when he died, killed in action on August 5th 1915. Bernard Henry's father worked from home, where the front of the house was kept as a sweet shop. Bernard was educated at Church Street School, and at the age of twelve, joined the Boys Brigade taking part in all the activities there. After leaving school he found employment at Messr’s Ericssons Ltd.
Bernard Henry and Ernest Tonks, a close school friend and Boys Brigade pal, enlisted together at a Nottingham Recruitment Centre - their service numbers being next to each other. There they joined the Kings Royal Rifle Corps and were both posted eventually to the 10th "Service" Battalion which had been formed at Winchester on 14th September 1914, being part of "K2" Kitchener's 2nd 100,000 men who enlisted for the duration of the War. The 10th Battalion was part of the 59th Brigade, 20th Division. After a posting to Blackdown, the battalion found itself at Whitley Bay. In April 1915 Riflemen Bernard Henry Spray and Ernest Tonks did their final training at "Hamilton Camp" near Stonehenge, and on 21st July 1915 the battalion landed at Boulogne. Bernard Henry Spray was shot by an enemy sniper while serving in the trenches and died in a Casualty Clearing Station. He was buried in Plot I. 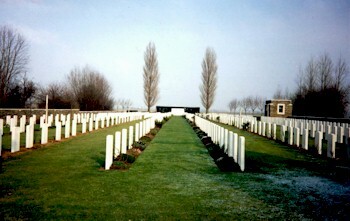 Row H. Grave 9. of the Rue-David Military Cemetery, Fleubaix. Riflemen Spray and Tonks are also commemorated in the Kings Royal Rifle Remembrance Book which can be found in Winchester Cathedral. 2The address given in the records of the Commonwealth War Graves Commission. At the time of the 1901 Census, the family was already living at that address. (Piece 3153 Folio 46). Edwin Spray was then working in the cycle trade, probably at the Humber Works in Beeston. He may well have lost that job and started on his own when Humbers abruptly moved to Coventry in 1908. Both Edwin and Mary were born in Beeston about 1877. 3His sister, Florence, was born in about 1905.